There are lots of online resources. Just google them. There used to be moderators that would take psybucks or free requests and make them but im not certain of their activity anymore. There used to be official Psypoke trainer cards up until around 2008. sN0wBaLL made them and they were neat since you could get ribbons for participating or placing in community activities. 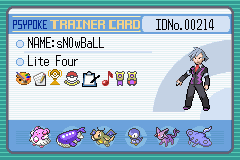 I toyed with bringing back official trainer cards a couple years ago using the XY card style and Gen VI trainer sprites but I didn't think it would catch on so I shelved it. Here are a couple of test cards. I don't know why I used Dare234 for an example lol.